Can I tell you about my recent trip to my most favorite place on earth? I must warn you, it's not sewing related, but may be of interest to those of you who love history or Old Hollywood. 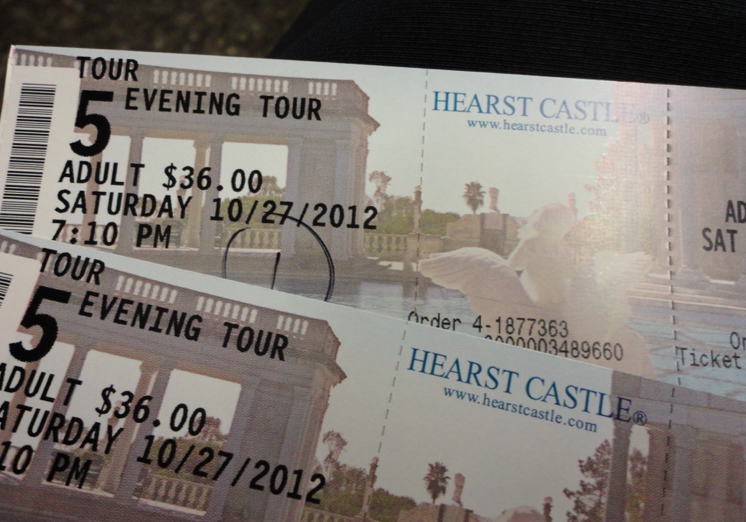 For our anniversary Luke and I went on the Hearst Castle night tour, the only tour I had not yet been on. 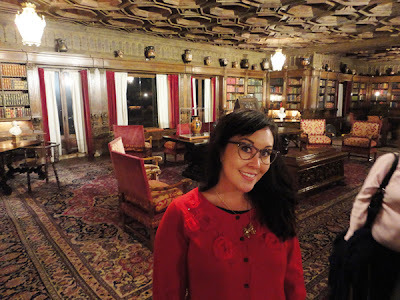 There is so much to be said about William Randolph Hearst, the creator of the famous castle, owner of many newspapers, journalist, and art aficionado, and what I quickly touch on will not do him justice. There are many books written about him and I highly recommend this one if you would like to learn more. Not far from where I live is the most beautiful castle, Hearst Castle. It is nestled on a hilltop in San Simeon, California with a stunning view of the ocean and surrounded by gorgeous gardens. WR (William Randolph) had constant construction going on for twenty eight years and never officially finished building. 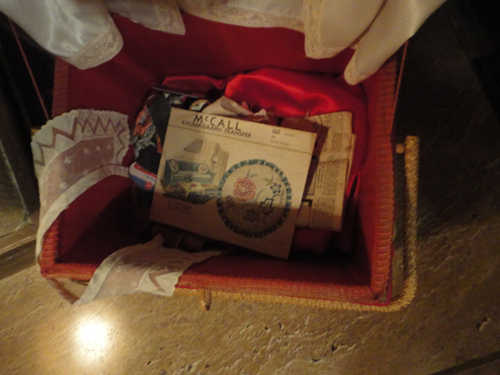 The insides are furnished with art from all over the world which span literally hundreds and thousands of years. WR and his companion Marion Davies (a well known movie star in the 20s and 30s) would invite all of the big names of the times for visits. It would not be uncommon to see Charlie Chaplin, Joan Crawford, Louise Brooks, Amelia Earhart, Howard Hughes, Winston Churchill, Cary Grant, Douglas Fairbanks, George Bernard Shaw, F. Scott Fitzgerald, or Jean Harlow walking the grounds. It's a very long guest list and those are just the ones I can name off the top of my head! FYI I would love to time travel to this time and place! 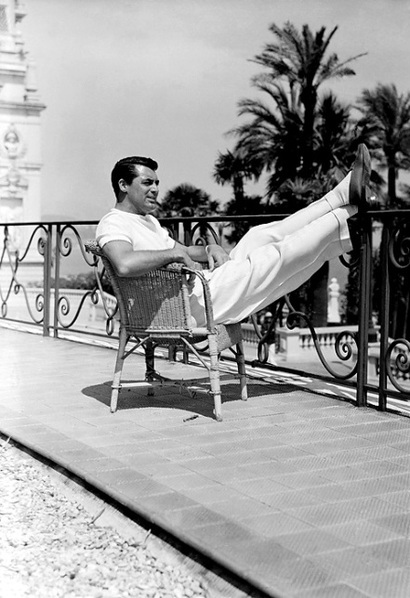 Cary Grant relaxing at the Castle. Alright, I'm dying to show you pictures from my latest trip! Just so you know, on all tours camera flash is not allowed. 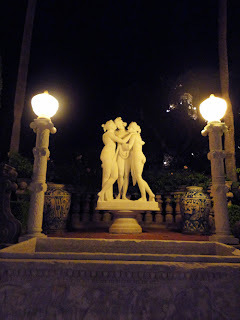 It made taking pictures at night a little more difficult and some are grainy, but there are still a few good ones. It's a fairly quick bus ride up the five mile hill to the Castle. I found the photo of the girls on the Life google search a few years ago. It always cracks me up! Our next stop was to one of the guest houses. All three of the "guest houses" on the property are what I call a "mansion." 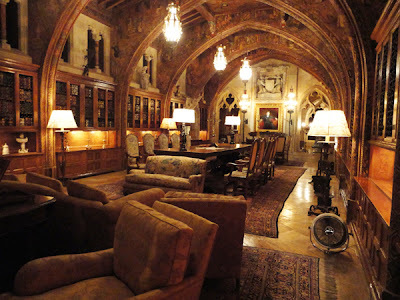 The one we went into was the biggest of the three and the one that Hearst resided in while the Castle was being built. It is just as ornate as the Castle. 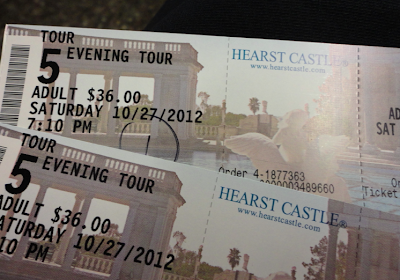 One of the perks of going on the evening tour is seeing people dressed up as Hearst's guests. 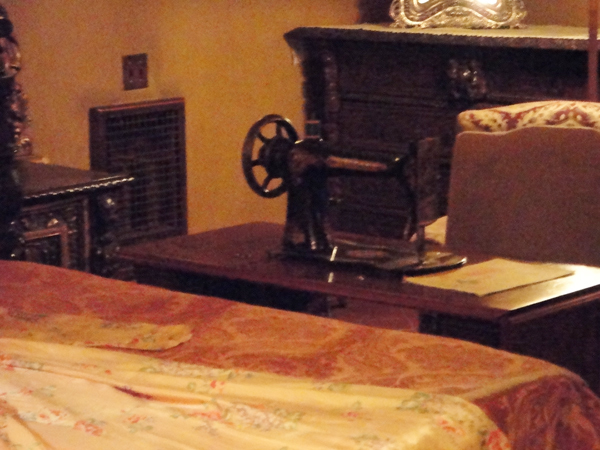 A Singer sewing machine! I couldn't go in the room, so I leaned in as far as possible and zoomed in on my camera. It's much more amazing in person. The "living room" was the first stop inside the actual Castle. The guide told us a story about Errol Flynn doing impersonations of people in front of the fireplace. The "dining room." Hearst sat in the middle of the table and the newest or most interesting guests sat closest to him. 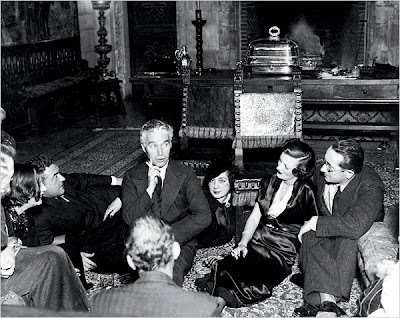 If a guest exceeded his or her stay, Hearst slowly moved them towards the end of the table, next to the fireplace. 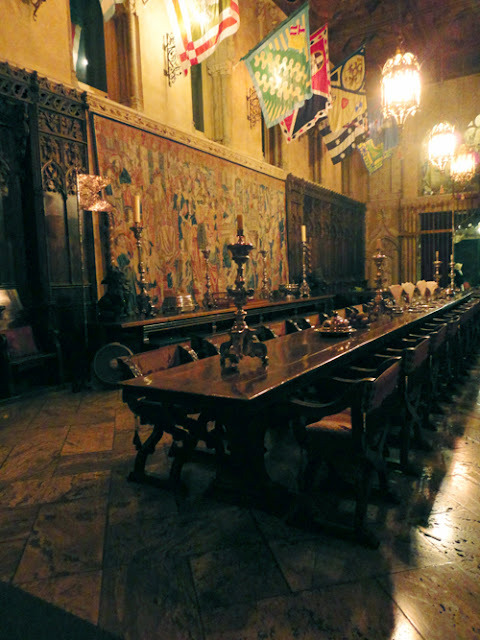 A guest (I believe it was Harpo Marx), was seated at the end of the table and said he had no idea how the food at the Castle tasted, as he ate as fast as he could to get away from the fire haha. 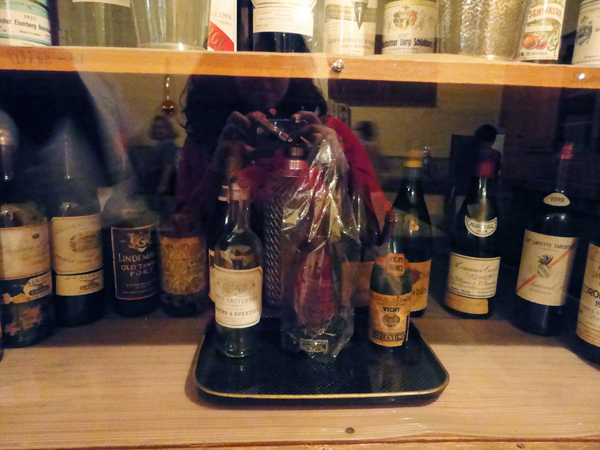 Guests were allowed to drink small amounts of liquor and they were not allowed to bring their own. This caused people to try and smuggle in alcohol in their suitcases! The library where legend has it that Marion Davies would tumble across the rug. 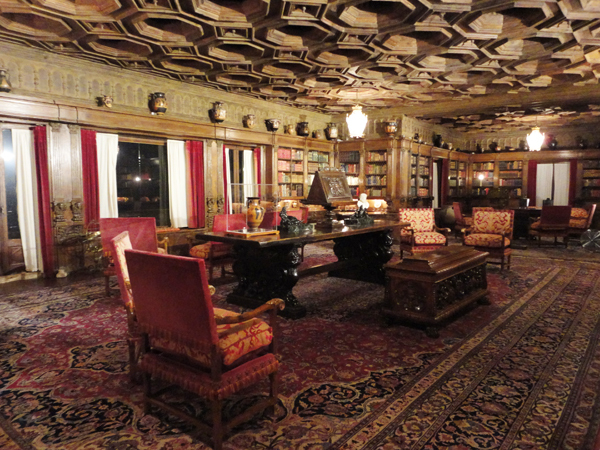 Hearst's study. The painting of him was added after his death. The tours always end with the most beautiful pool I have ever seen, the Roman Pool. It is breathtakingly stunning. There are eight statues throughout that are either Roman gods or heroes. It's crazy to think that the tiny tiles have gold inside! When the tour ended our guide told me that I should come back and work at the Castle, it made my night! We talked a lot about Old Hollywood and my love for Marion Davies, so I think she could tell that I was a big fan :) If I didn't have a HUGE fear of public speaking working at Hearst Castle would be a dream. Have any of you been there? Does anyone have an interest in Marion Davies or William Randolph Hearst? Oh, I love this! It reminds me of the Biltmore, which is on my side of the continent :) GOD I WISH I WAS RICH. All that opulence... and the movie stars. I'm so jealous you got to visit! I want to visit the Biltmore!!!!! amazing! I can feel a bit of an internet spree coming up to research all these people. A new interest may have formed for me! Let me know if you want any book recommendations! I've read a good amount! I visited once when I was a little girl. Then later as an adult a friend of mine gave me a book about Julia Morgan. 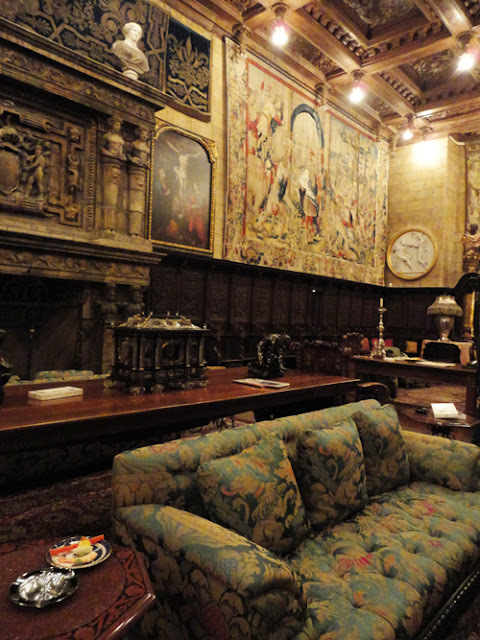 The ground breaking female architect who designed Hearst Castle. 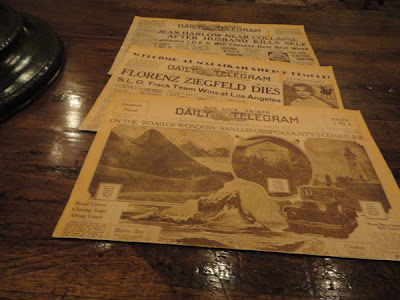 I am interested in learning more about Julia Morgan. She built The Monday Club, a building in San Luis Obispo, and many more throughout the state. Go! I'll meet you there! Meg, that is so rad, I want to stay there next time I am up north. 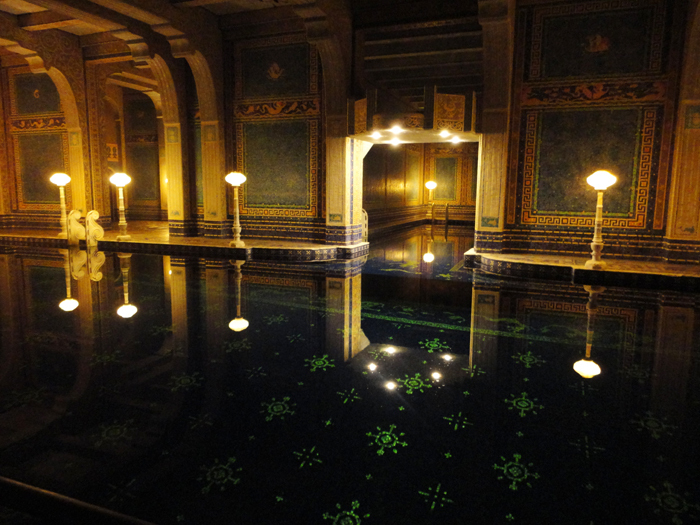 Julia Morgan, the person who built Hearst Castle, also built the pool you showed me. Thanks for the tip! Ah, Erin, so cool! Happy anniversary :) I did the day tour a few years back and loved it! The pools are SO incredible. I think the pools are the best part because they still look fresh and inviting. The inside is awesome too, but a little more dated looking (and void of life). I would love to float in those pools though!! I daydream about those pools! I agree though, the Castle isn't the most inviting place. Although, at night it seems more cosy. I don't know if that makes sense, but it definitely has a romance about it that isn't seen during the daytime. I've driven past before, but never taken a tour, now you're making me want to!! Also, I'll be up your way for work at the end of the month, would love to get together if you're available! Jill!!! For sure I would love to meet up! Let me know when you will be here and we can work on meet up details :) Yay!!! Erin, you should TOTALLY be a tour guide there! I'm so jealous, California has the coolest things! Thank you for sharing photos :) They're so beautiful! I went once when I was a teenager... it really is an awesome place! You should definitely interview to work there! Even if you don't like speaking in front of people, I bet you would find it easy in this case, because you'd be sharing something you're passionate about! That is very true, when I know something inside and out I feel more confident talking about it! 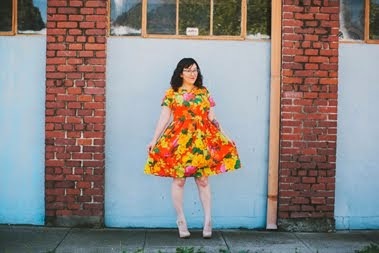 Thank you for sharing these pictures, I had no idea this place existed! Next time I am over your way I will definitely plan a visit as this look amazing! When I was 9, I visited California for the first time. 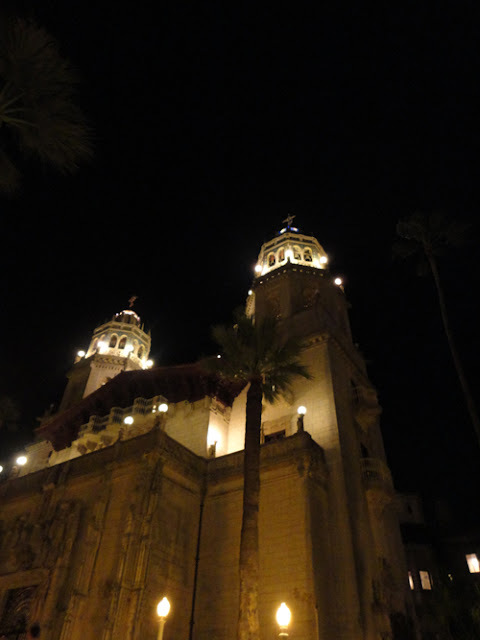 My favorite thing we saw was Hearst Castle! It even beat out Disneyland! I really need to get up your way and see it again. Yes, Marrie! And let me know when you are in town!!! That's so awesome! I've never been but I'd love to! It's nothing like I have ever seen. I can't recommend it highly enough. Wow! Wow! Wow! Amazing!! I have seen Heart Castle on TV, but never at night like this. So cool! The only thing that comes a bit close that I have seen is the Breakers in Newport. I will have to look into Breakers... Thanks! Shanni, that is EXACTLY what I was thinking!! Happy anniversary! How cool! 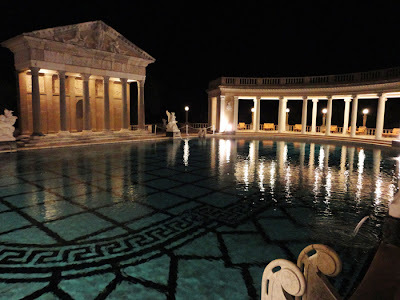 I've always wanted to go to San Simeon, but never had the chance! Next time in California I'll definitely go-- it looks amazing! How often do you come back to CA? oooh, i loved hearst castle! i went there a few years ago. i tend to like old mansions built by crazy rich people and i think this one tops the list. you're right, that pool is amazing! on my tour they said that no one ever really used it because people thought it was too deep. Just curious, do you need some kind of written approval to post these photos? 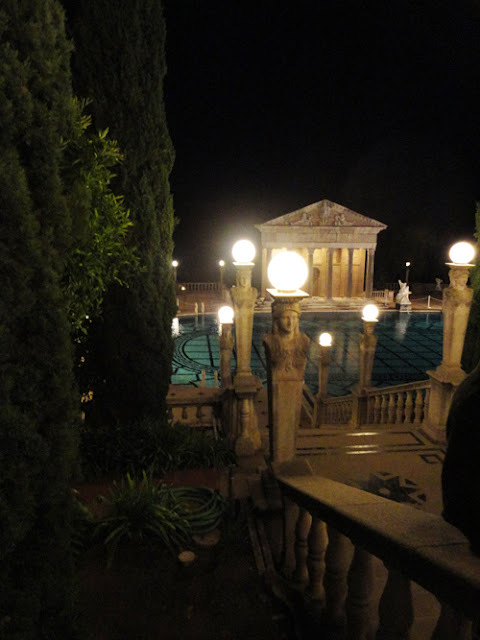 On the Hearst Castle website, there is a photography policy. 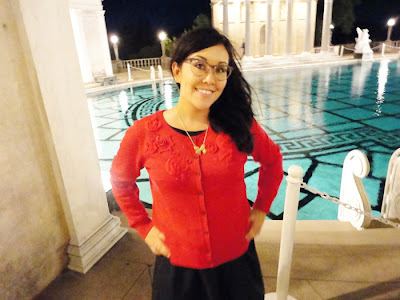 I actually e-mailed Hearst Castle and got the following response: " I am sure your photographs of the castle for your blog will be spectacular, we encourage our visitor to use images they took while on tour." Wow that's great. Thanks for letting me know. It's good information you have about Hearst Castle. Thanks for sharing. Long time no talk! Hope you're doing fine -- I guess I am, although last month I tore a tendon in my right knee and I'm still recuperating. Great pix from the night tour. Haven't been to San Simeon since 1989 (when I took three of the four tours then offered over the course of a day), and have to make it back one of these days. My goal is to someday move to Los Angeles and do film history research, which would make it much easier to visit the castle. I enjoyed your post, found this quite by accident. I spent some years as a guide at Hearst Castle so do recall the sewing machine very well. sadly, no one asked me about it on tour but I sure wanted to talk about it. from memory, it is a very common ordinary machine made by Singer, a model 128 made around 1890. It is impossible to,say if it was used by Marion Davis or not but I personally feel it was. There are telltale cigarette burns on the table leaf, as if some one was smoking then setting the cigarette down for a minute. 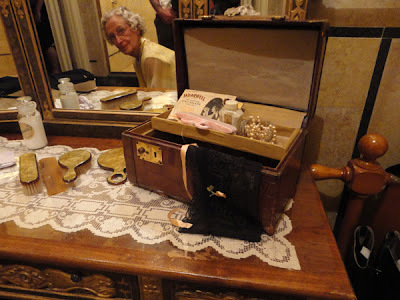 There are several very charming comments made over the years in biographies and oral histories about Marion Davies being a very good seamstress of both clothing and quilts. She surely could have a more expensive electric model, and may have, but due to fluctuations in power and how nicely treadles work she may have kept this up there for quiet times. I like to think so. Thanks for the memory.